We can build a custom WordPress plugin to fit your needs. Whether it needs to integrate with WooCommerce, a forms solution, another plugin, or just stands alone - we follow a standards driven approach to extend the functionality of your site. Whether it is a brand new site or an existing one that needs updates, we can help bring your vision to life. 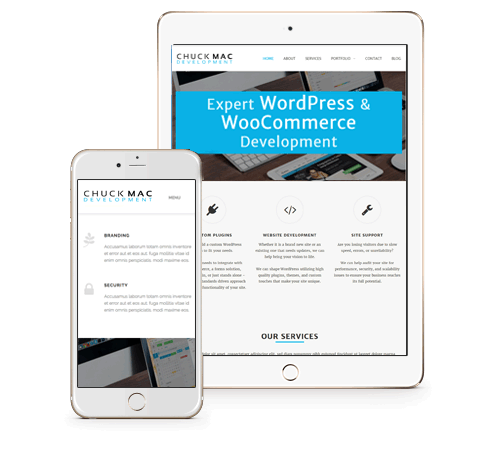 We can shape WordPress utilizing high quality plugins, themes, and custom touches that make your site unique. Are you losing visitors due to slow speed, errors, or unreliability? We can help audit your site for performance, security, and scalability issues to ensure your business reaches its full potential. We create high quality custom plugins to get the most out of your WordPress system. Ecommerce solutions to maximize your business. We have performed dozens of WooCommerce integrations and customizations. We can help with your custom form needs. Complex rules, 3rd party integrations, or customizations. We have worked with the major form systems including Gravity Forms, Ninja Forms, and Formidable. Connecting your WordPress system to a 3rd Party? Payment gateways, drop shippers, CRMs... we can provide an integration solution to get your site connected to keep your business flowing. Chuck understood the brief first time, asked a couple of questions to clarify but was then off. Finished and delivered quickly, and so responsive as we tested. I can't recommend him highly enough. Chuck was great to work with. He was clear and precise in his communication with me. I would highly recommend Chuck. I'm very happy with what he did in this project. Best thinking and discussing of solutions and wonderful coding. Now my plugin is faster and can handle bulk orders e.g. 1200.